Great social media and great Google rankings often go hand in hand. We know that lots of our clients, the workings of search engines and what Search Engine Marketing (SEM) companies do is a total mystery. To help you out, we’re very grateful to Blaine Peakall, a local SEO expert based near us in Bury St Edmunds, for guest posting the article below. So much time, effort & cost was consumed in preparation. Design, messaging, imagery, navigation and content were carefully crafted to create your winning proposition. But a few weeks after launch, reality struck. You had expected a steady stream of enquiries from your website but they didn’t come. You tested the web enquiry form over and over assuming that a technical glitch was directing your valuable leads into the eternal ether. But, the tests checked out fine. Finally someone showed you how to access your website analytics. That’s when you understood the problem – people weren’t visiting your site. Every day there are over 1 billion searches on Google for information. That’s a lot of potential visitors. But here’s the problem – there’s over 550 million other websites. That’s a lot of competition. You cannot simply assume people will find you – you have to work hard to be found. Search Engine Marketing is a method of inbound marketing in which your goal is to ensure your website is found by people searching for the products and services you offer. 90% of user searches never go beyond the first page of search results, so to be found you need to rank prominently. Not simply for brand or company name searches, but for people searching for the products and services you provide. There are two places to appear in Google search results. 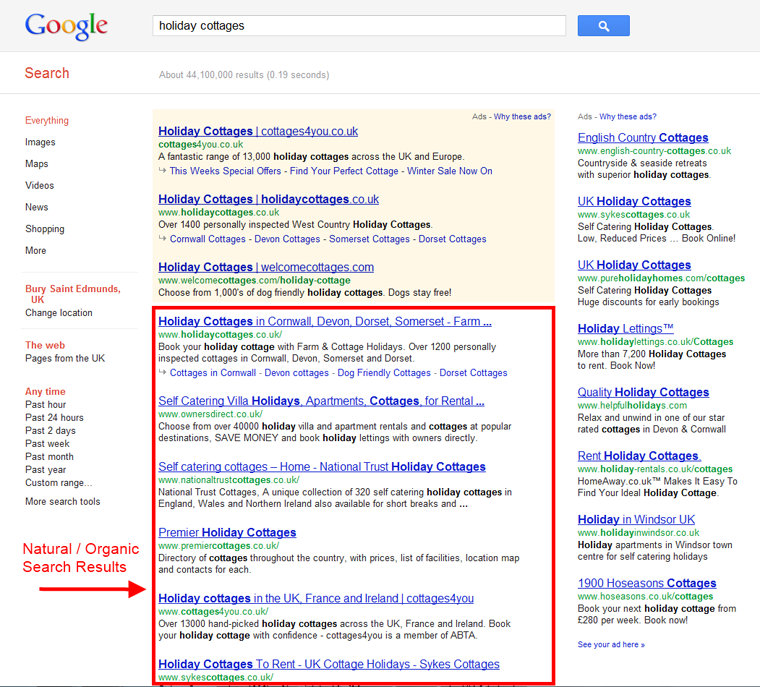 The organic / natural listings are the main body of search results (which may include news, images, videos, place results etc. 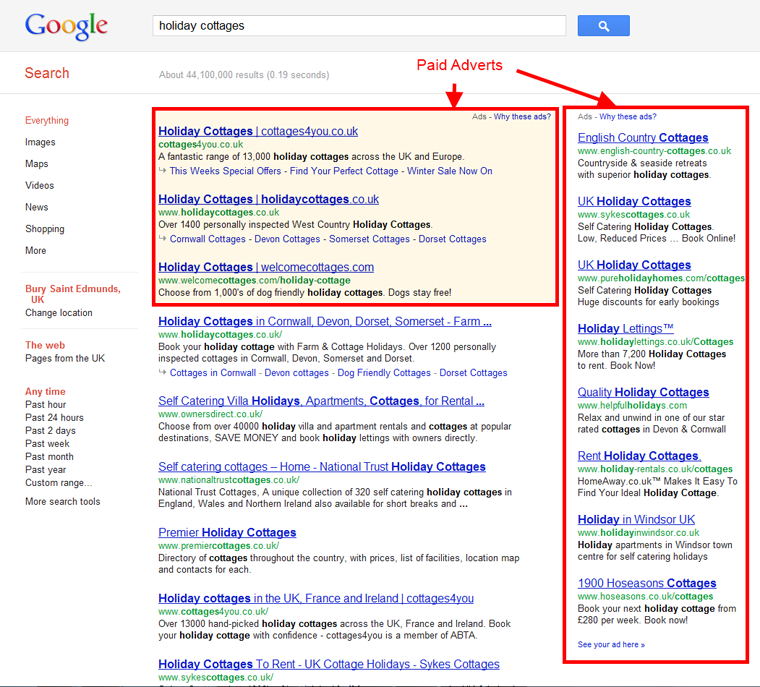 depending on your search query) and the paid adverts which appear above and alongside the natural listings. Search Engine Optimisation (SEO) helps you achieve a prominent position in the natural / organic search engine results for your chosen keywords. These listings are unpaid, unbiased and algorithmically generated. SEO and PPC are very different techniques but the goals are the same – to get your web pages ranking prominently in the search results in order to generate traffic to your website. If you get it right you’ll tap into the huge online audience and your inbox will be overflowing with web enquiries. Blaine Peakall is the founder of Peak Demand, a Bury St Edmunds based Search Engine Marketing Consultancy. He is accredited by both Google and Microsoft and provides SEO and PPC advice, training and consultancy services to organisations in the East of England.